Torrent client provider BitTorrent was hit by user uproar earlier this year when it was found that their most recent uTorrent versions included a bundled software that mined for cryptocurrencies like Bitcoin. 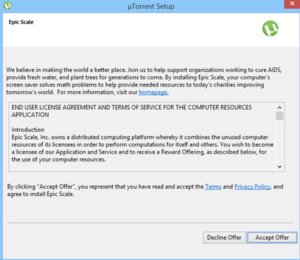 Starting with version 3.4.1, uTorrent came bundled with Epic Scale, a mining software that used your PC's idle CPU time to "solve complex problems" and mine for currencies. Many complained that their PC's performance was significantly decreased after installing 3.4.1, and others complained that the software was extremely hard to remove. Yet more users complained that they never gave permission to install Epic Scale. Version 3.4.2 removes Epic Scale but otherwise is identical to 3.4.1, which should make plenty of users happy. I'll stick to 2.2.1 version thank you very much. Yet again, I'm forcefully reminded why uTorrent clients past 2.2.1 are unmitigated greasy poo. Bleh. I was just about to say that 2.2.1 is the last one worth using too!!! I just bumped back down to it a few weeks back after not really paying attention to the poo-filled nastiness that is EVERY RELEASE AFTER THIS ONE. Words could never be truer my friend! qBittorrent FTW. Lightweight, open source, seems less prone to crash than Deluge, at least in my experience.